As beautiful as your home is, what makes it different from others are the decorations. Sofas, chair, desks, tables, wardrobes and all the paintings hanging on the walls. But what is the first piece of decoration that you lay on your new home or room? Obviously, carpets right?? It is a unique design and texture adding a striking design element to your home giving a welcoming feeling to your guests, friends and family. Carpets are usually one of the biggest decoration investments in your home and are one of the popular choices for many homeowners. And keeping it clean is one of the headaches they have to bear as they are exposed to constant wear and tear from people, pets and more. The wine stains, dust particles are the known enemies of carpets and they are hard to get rid of. If you have ever tried to get your carpet clean by yourself, you know the pain. You brush, vacuum, use all kinds of detergents and soap and end up damaging the piece itself. Why take on all those troubles when there are professionals to do these kinds of jobs. Many people think that professional carpet cleaning is a waste of time and money and is only for the rich, but in fact, they are completely wrong. There are different reasons why you should let professionals do their work because nobody understands the fabric, the texture and the art of the carpet is more than the professionals. And also many people have a misconception that vacuuming will keep their carpets clean but vacuum only removes dirt and dust. But it doesn’t provide the hygienic feel the professional cleaning does. For you, we have pointed out the top 7 reasons you should hire a professional carpet cleaning services rather than doing it yourself. Even though your carpet may look like the one your neighbour has, it may be made from a different blend of fabrics. The regular cleaning process may degrade the quality and texture of the carpet and also in the process degrading its lifespan. Professional help in cleaning and maintenance can help your carpet live for the extensive time period. How do you feel to see a quality carpet with the stain of red wine or a cake? It just doesn’t go with the decoration, right? And have you tried cleaning the stain yourself? If you do, you know how hard and the nerve-racking job it is. Professionals carpet cleaners can help you get the stains out of the carpet and also maintain its odour and appearance. With their advanced tools and cleaning methods, they can formulate the best solution to remove tough and old stains. As you come home from a hectic day at the office, what kind of room do you want to walk into? Aesthetics is one of the main reason you would want to get your carpet cleaned by the professionals; nothing worse than walking into a home with a dirty and ragged carpet. It looks bad, smelly and will give a not so welcoming feel to your guests, friends and family. Rental equipment and small fry tools may come in handy during the emergency situations but can’t compare it with the state of the art equipment the professional use. The professionals are equipped and trained with specialized tools and machines to clean every corner of the carpet. They use top quality agents matching your carpets fabric ensuring a clean and healthy carpet for your home. Maintaining a hygienic and sanitized environment, that your home is very important. Most rental equipment doesn’t come with the proper sanitation products. Just cleaning the dirt and stains is not enough, germs can accumulate on the fibers which can lead to allergens and pose dangers to human health. Hiring a professional carpet cleaner can ensure the goal and promote good quality living and healthy life. We all know carpet cleaning is a time-consuming job and I have to say in here over and over again. And if you can utilize that time, you just spent on carpet cleaning, to a better use you could have a better productivity. So why waste time when you can hire a professional? Why hire a professional? Because they assure of the quality service and more they possess the experience required to do the job and you can be relaxed that the job is in good hands. Hiring professional carpet cleaning services will not only save your time but, it will also save the life of your carpet. Professionals know the right way and tricks to keep the carpet clean maintaining it’s quality. 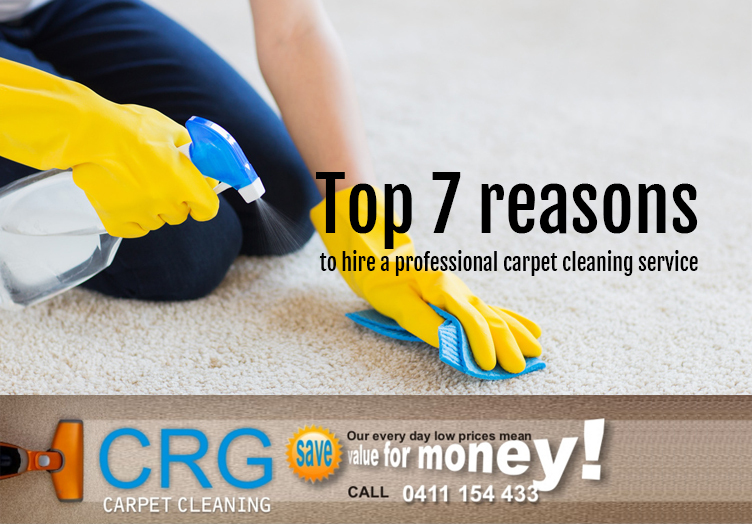 When it comes to professional carpet cleaning services in Adelaide, CRG Carpet Cleaning is known as the best and reliable. Call us on 0411 154 433!